Hoffman writes of struggling to know his father, or the challenge of the two fathers: “the one who made me, and the one I’ve made of him.” This is a memoir mostly of Hoffman’s adult life; it also handles race and class and family (the title refers to his theory of familial relationships). 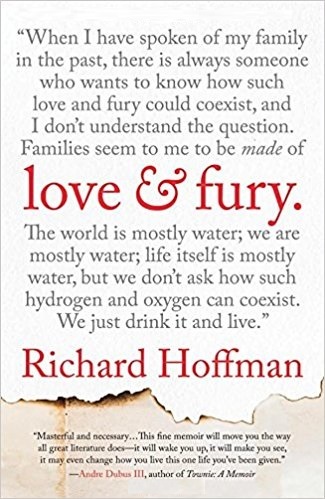 Hoffman is particularly concerned with questions of the racism, sexism, misogyny and abuse, the toxic masculinity, the blue-collar working class Pennsylvania of the coal mines with which he was brought up. In the course of the book, he becomes a grandfather and his father dies: these are the occasions for his reflection. And he is calm as well as reflective, introspective; he tries to be hard on himself and look the truth in the eye. This is the classic, universal question I am interested in: the mystery of one’s own parent(s). I enjoyed Love and Fury. I felt immersed in Hoffman’s reckonings, and I very much identified with the struggle to know the father figure. I liked how he anticipated concerns about his memory, as when he prefaces an early childhood memory with questions about early memories generally, or where he admonished himself to say it (a difficult truth). It felt considered, as a book, if that makes sense–thought out. In fact it is more a memoir-in-essays, with lots of thinking on the page, than a strictly narrative story. A memoir for those interested in social justice as well as family.